If you’ve ever wondered how footage of sports fans in the stands is shot for commercials, Michael Rand can tell you exactly how it happened in one specific instance. 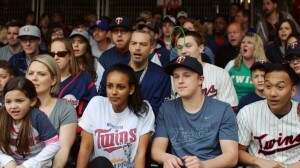 Video (00:31) : It's the commercial in which Miguel Sano hits a home run and fans in the ballpark and elsewhere react. If you’ve ever wondered how footage of sports fans in the stands is shot for commercials, I can tell you exactly how it happened in one specific instance. I was there, and I participated. You’ve likely since seen the commercial, which began airing recently: in it, Twins fans in a bunch of different scenarios stop what they’re doing — sometimes to the point of distraction — as Miguel Sano hits a long home run. The shoot was April 19. The Twins, after sputtering to an 0-9 start, had won four games in a row at home and were playing a “getaway” game at 12;10 p.m. on a Tuesday against the Brewers. 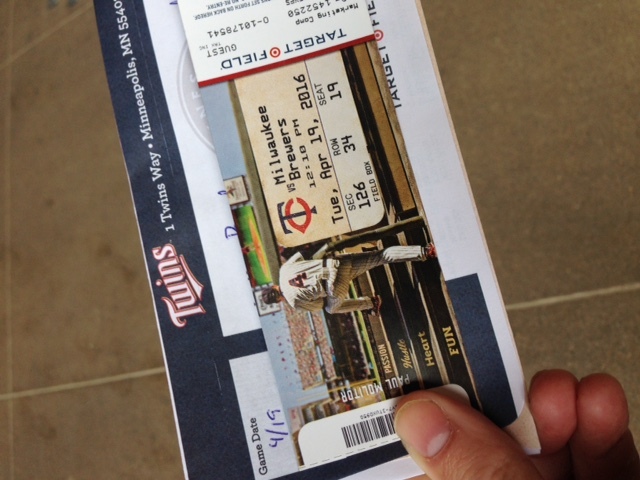 A few days earlier, I had heard about a commercial shoot for a new Twins spot and made arrangements to sit in on it. Why? Well, after spending roughly half of my close to 40 years on earth working in sports media in some capacity, I’m always looking for new experiences about which to write. The protocol was fairly simple: the extras were supposed to meet outside of Gate 29 before the game to get their (free) tickets and then gather in Section 126 (down the left field line) before the game started. 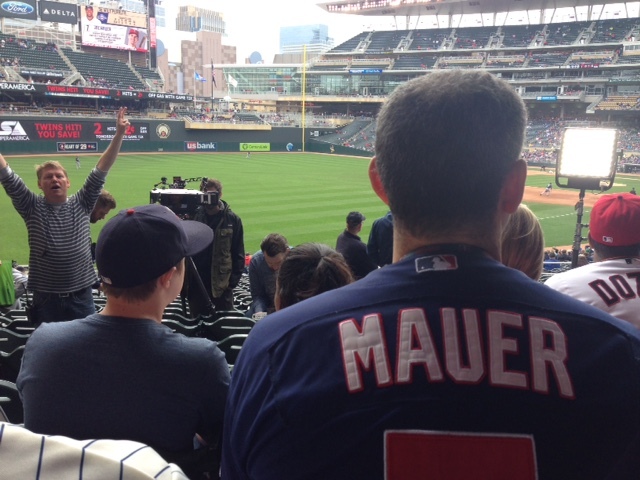 We were encouraged to wear Twins gear, but otherwise non-logo gear. And once the shoot was done, we were free to watch the rest of the game (which the Twins ended up losing 6-5). I headed to the section about 20 minutes before first pitch. Folks from Periscope — the agency putting together the commercial — were milling around and getting set up. There was a VERY fancy camera and a lot of important-looking people (director, camera operators even a make-up person!) preparing for the work. I took a seat next to Robert Meshbesher, another extra who said he found out about the commercial shoot from Facebook. He said he used to have season tickets but no longer does. He hadn’t been to a game yet that year and figured this was a great way to make one. Some extras had won contests to be part of the shoot; others had answered casting calls. And then there was me. I wanted to write about it. I wanted to participate in it as part of that process. But secretly I was hoping that I wasn’t actually IN the finished product. In any event, we got down to business as the game started. Basically, we were there for two scenes: one in which we all stopped what we were doing and looked in the same direction, and another in which we were supposed to stand up and cheer wildly. If you think that sounds easy, it is not. On the first scene, where we all looked in the same direction, we must have done at least 15 different takes. The director gave instructions, as directors do: less leaning forward; don’t look so eager; make sure you stay focused until the camera stops rolling. They rearranged us into different seats. They gave some of us different shirts to wear. Same thing with the second scene: be excited but not too excited; OK, that was toned down too much. Take after take. It was fascinating and strangely nerve-inducing. You don’t really realize how hard acting is — or what a bad actor you really are — until you have to do something on command instead of naturally. And in the midst of it all, the Twins kept getting hits (can you believe it? ), which messed up the timing of a couple takes. And there were ACTUAL fans there to see the game. If something unscripted happened in the background, that could ruin a take. But we made it. All of our *hard* work ended up being for less than five seconds of a 30-second spot. Overall, I liked the fact that they filmed the spot during an actual game. In my head, I assumed these things typically happened in empty arenas or ballparks — or at least not during the action. In this case at least, the filming happened right in the middle of a real game. And as you can see in the frame grab (courtesy of Periscope, click to enlarge), I got my wish: I’m in one of the two scenes, but just barely — hidden behind a fan in a white Twins jersey, you can barely make out the side of my face and hair. Meshbesher, who was sitting next to me on my right (beard and glasses), got all the glory. Maybe if I had been just a little better at leaning forward? New Falcons stadium: $2 hot dogs, $5 beers, pricey seats. How do Vikings compare? Was NHL vet Paul Martin as much of a Minnesota prep star as Joe Mauer?